The Philippines is sending a Catholic priest to Kuwait next month to assist Filipino migrant workers who escaped from abusive employers. The announcement by church leaders came on the same day Kuwait ordered the Philippine ambassador to the Gulf state to leave the country for alleged "undiplomatic acts." The Kuwaiti Foreign Ministry gave Philippine ambassador, Renato Villa, a week to leave the country after embassy staff reportedly encouraged Filipino workers to escape their employers' households. Kuwait has also recalled its ambassador to Manila after a video came out on social media of embassy staff helping Filipino maids flee the homes of their employers. Video clips of the rescue were uploaded and distributed to the media by the Philippine Foreign Affairs office in Manila. In one footage, a female worker is seen running towards a waiting vehicle while being assisted with her luggage by a man speaking in Tagalog. The Kuwaiti government protested the "inappropriate behavior" of Philippine embassy staff, who participated in the "rescue mission." Bishop Ruperto Santos, head of the Episcopal Commission for the Pastoral Care of Migrants and Itinerant People, said the church would assess the needs of the Filipinos in Kuwait. The prelate said the commission is sending Father Restituto Ogsimer, a Scalabrinian missionary, to help offer pastoral care to migrant Filipino workers. "[Father Ogsimer] will assist, be of service, and help our Filipino priests there in Kuwait for our [migrant workers]" said Bishop Santos. The prelate said the priest will spend the month of May in Kuwait to help Filipino priests there, especially those working in shelter homes and to hear confessions and do counseling. He said there are "very good working relationships ... communication and constant collaboration" between church and Philippine government offices in Kuwait. Bishop Santos said Father Ogsimer will look into the "real condition" of workers there "and to let them feel that the Philippine Church is concerned about their welfare." 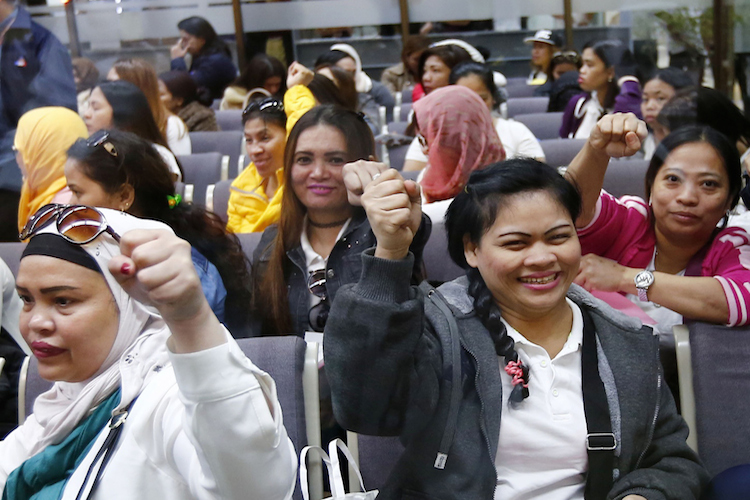 An estimated 250,000 Filipino workers, mostly domestic helpers, live in Kuwait. Bishop Santos expressed hope that the issues between the Philippines and Kuwait will finally be resolved. Philippine President Rodrigo Duterte ordered a worker deployment ban in Kuwait early this year after the discovery of the body of a domestic helper who died at the hands of her employers. An organization of migrant workers demanded on April 26 that the Philippine government apologize to Filipino workers in Kuwait for plunging them into "deeper trouble" after the rescue operation. "The government should reveal who were the masterminds and partcipants in this stupidity and make them fully accountable," said Arman Hernando chairman of the group Migrante-Philippines. He said that if the Philippine government is sincere in rescuing distressed workers "they should have put such a mechanism in their bilateral agreement with Kuwait." Hernando said the government is placing all guilt on abusive Kuwaiti employers while highlighting the rescue mission as an act of government heroism "when in fact it is the state's labor export program that drove many Filipinos to slavery." Early this week, Kuwait lodged a diplomatic protest claiming violation of its sovereignty after Philippine embassy staff helped rescue allegedly abused Filipino workers from Kuwaiti homes. "It is our prayers and hope that everything will be dealt with peacefully and amicably," said Bishop Santos. The Philippines' Department of Foreign Affairs has summoned the Kuwaiti envoy to seek an explanation about his government's order to expel Philippine ambassador Renato Villa. A Foreign Affairs office statement said the action taken by the Kuwaiti government is "deeply disturbing" and is "inconsistent" with the assurances given by the Gulf state to move bilateral relations between the two countries forward.